Nothing keeps my head in the game as effectively as rereading the first few posts on this blog. As you climb the mountain, sometimes it’s useful to glance behind you. One week ago I was posting about shooting my drum DVD imminently (I began last Friday), and lamenting the demise of my Shoe Muse but entertaining the idea of doing something else – designing an iPhone app, perhaps. The further I get into this, and the more I listen to things like the Smart Passive Income podcast, the more I understand the fundamentals at work. -Most of us have something we’re exceptional at, or a problem we’ve solved, that others would value. 1) Sell our information directly (simplest but probably lowest reach). This is basically the approach with my drum DVD. Instead of teaching hundreds of hours of lessons, I’m putting my best practices in one place where thousands of people can access them with no effort on my part once the DVD is complete. 2) Get a little “meta” on our skill, and figure out something we have to offer others with our same skill set. An example of this would be finding something I as a drummer or musician can do that other drummers or musicians would value, for instance creating a website to review teaching materials (uggh), or a personal trainer with a programming background creating a software to help other trainers manage their clients’ diets. 1) Sell it directly – wall the content off and charge a price for a download, DVD, eBook, whatever. 2) Give it away for free and build a community by establishing ourselves as authority figures in our niche, then charge the corporations to recommend products useful to our readers/viewers. These can be used in combination, too, and a combination will most likely be what I use for the drum DVD. 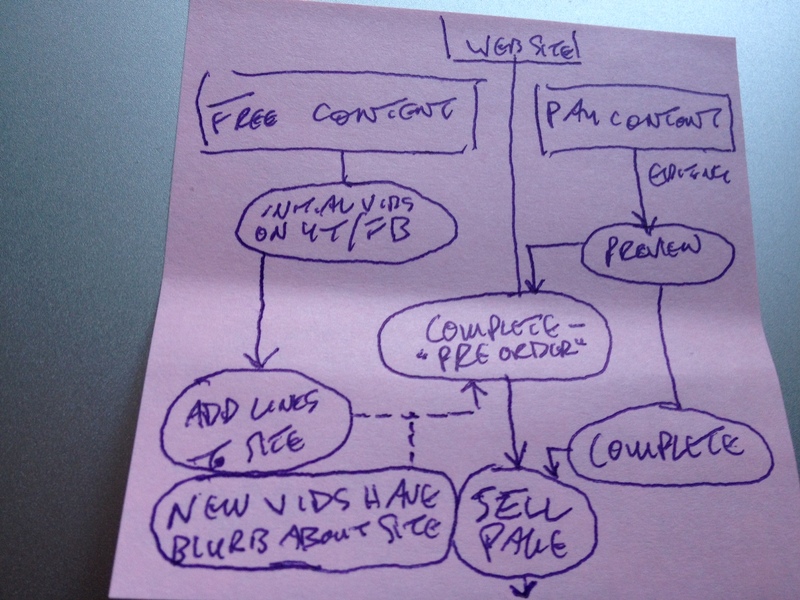 Some people post tons of high value free content, then use that to promote their paid product (“freemium”, even though that’s borrowed from software), and some even enjoy success by giving away all their content for free, but charging for a video series or eBook that puts things into an organized, easy to use format. The deeper I get into this the more I understand I have pretty good instincts too. Maybe it’s the years on social media, the years in music. When you’ve seen every pitch you’re naturally suspicious, and if you’re savvy and ethical you won’t expect people to put up with anything you wouldn’t put up with, and you want to deliver to them the same value you would expect. I’m kind of playing it by ear with The 8020 Drummer. As it stands I’m bifurcating free and paid content, but if as it nears completion I feel like I wouldn’t pay for it myself, I’ll give it away and find another way to monetize. Drum DVD – so how’d it go? Taping was difficult, as I expected, but fun. Over the course of two days I found a rhythm. Instead of using the standard model of sitting behind the drums and alternating talking and playing, I’m using a more “behind the music” documentary style. My practice space actually looks really cool with Marshall amps in the background. Have to reshoot a few things due to lighting. Learning curve. 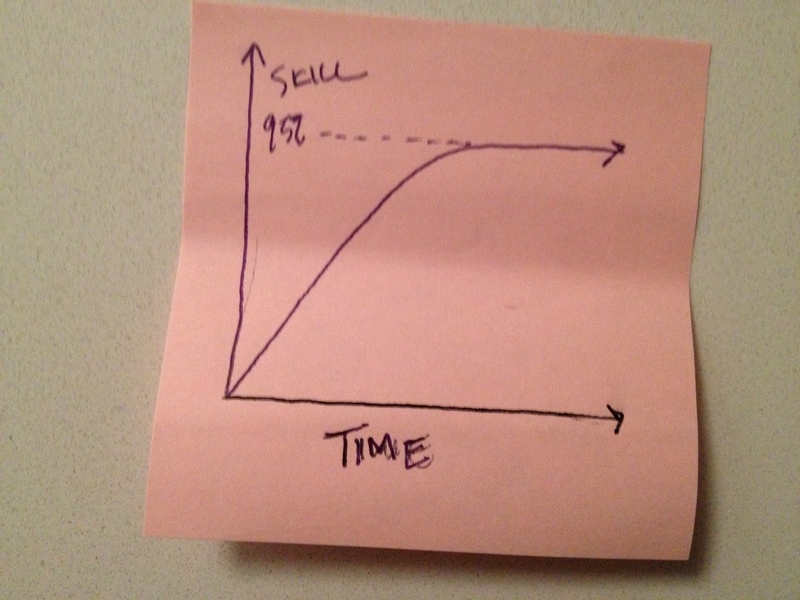 Above all it needs to be clear, and the deeper into it I get the more clear the thesis becomes: you can accelerate your progress in a complex skill by focusing on the steep part of the diminishing-returns curve for multiple skills. Uncoached, many musicians will waste countless hours practicing things in the flat part of the curve (things they’ve already got pretty well under their hands/chops, and for which further progress requires a huge investment of time), letting other skills where they could make quick progress go unattended. To get from mediocre to top 5%, simply aim for 95% proficiency at a whole portfolio of skills, and you’ll improve quickly. In the video I tell you what those skills probably are, from years of teaching, playing, teaching myself, and passive observation, and show you the tools for the most important meta-skill in the arts: self diagnosis. Have a growing laundry list of free content to record, including many of the foundational skills for a lot of things I discuss in the DVD (aimed at intermediates looking to advance or proficient high schoolers headed for college auditions), and just for fun I used Google’s keyword search tool to identify a few things a lot of people want to learn, most of which are going woefully unaddressed by the vast majority of instructional material. Flow-charted the whole launch below, and I think this hews pretty closely to the best-practices recommended by my blogger heroes. Really quickly, I learned last week that you can make money from a skill long before somebody will hire you to do it. I must admit it stung to receive a message from a recruiter that she didn’t believe my content creation skills or grasp of online marketing was adequate for a managerial level PR job in higher ed. Nope. I needed a corporation to pay me a salary for using those skills so I could get them on a resume under a title at a real company (guess they didn’t dig 8020 Creative?) Hah. I’ve spoken before about how my day job teeters on the edge of tolerable. (If they’d just listen to me:P) So I’m in a constant search for something to transition to while I make the more long-term transition to online commerce. One such skill, which I’ll either teach myself or invest a few paltry hundred dollars to learn, is web design. Before I can launch any products, free or paid, I need to have baller websites. Luckily WordPress.org and the oodles of cheap templates (many themselves created by Ferrisite passive income “NR”), make it easy, once I devote the few hours necessary to learn it. Good luck finding an institution to pay me for low level coding and baller site creation. Their loss. Finally, the third way to make passive income I didn’t mention above is the latest “alternate joze” I’m looking into: niche sites that aren’t authority sites but which survive by using smarts to get to the first page of google, dropping just enough content to provide value to readers, then sending them off to the affiliate races. This is a marketing approach that doesn’t require a particular skill (drums, programming, Crossfit, what-have-you), save the meta-skill of Search Engine Optimization. No idea yet how, or even if, I’ll make those work, but now I’ve opened the door. See you soon! This sounds cool and amazing!